British Columbia’s provinc prosperity and economic growth are dependent on the availability of qualified, skilled and experienced workers so that the labour market needs of the province is met. This province has a shortage of skilled, experienced and qualified workers; hence the British Columbia Provincial Nominee Program (BCPNP) was introduced to fill the gap. In October, the British Columbia provincial Nominee Program has invited nearing to 472 Express Entry (EE) and Skills Immigration applicants from new invitation round, to apply for a provincial nomination to high scoring individuals. Numerous weekly draws were conducted this year for BC PNP, for this draw, many received invitations when compared to earlier draws. The British Columbia Express Entry (EE) stream is in line with the federal government’s EE system. It helps in successfully managing the applications submitted in the Express Entry (EE) pool for Maple leaf nation’s three major economic immigration categories. They include Federal Skilled Trades Class, Federal Skilled Worker Class and Canadian Experience Class. All those Express Entry (EE)applicants who have received provincial nomination earn extra 600 points, which would improve their Comprehensive Ranking System (CRS) score. The above applications for permanent residency status get processed under the Express Entry (EE) System. The processing time range is six months or less. 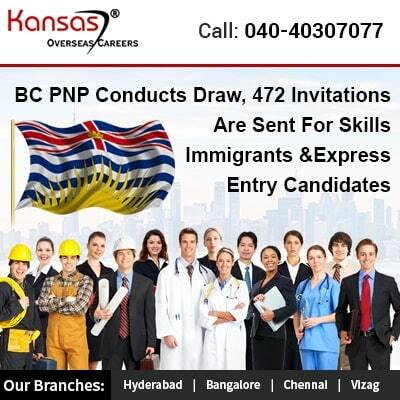 The Skills Immigration Candidates who have got an invite to apply for a Provincial nomination from the BCPNP round get pulled from varied streams such as International Graduate, Skilled Worker and Semi-Skilled and Entry level Categories. All those individuals who are interested in applying for immigration under the British Columbia PNP must have a full-time employment offer from an employer belonging to the BC Province. If you are interested in migrating to maple leaf nation under Express Entry (EE) or under Skills Immigration streams, then you must first create an online profile through BC PNP’s online system and then you are required to submit a complete registration form. After submission, your application gets evaluated, a specific score gets allotted to you. While allotments of the score different factors are considered they include education, age, work experience, language proficiency and numerous other factors. Our company is one of the top consultants in India offering the best immigration services to all who seek our services. Do you prefer to work in any of the provinces of Canada, our PNP Immigration Consultants would be happy to assist you.